Watch Falling Skies Season 4 full episodes online, free and paid options via our partners and affiliates. In the conclusion of the season 4 finale of Falling Skies, the 2nd Mass facing a terrifying new bomb while Tom and Lexi must beat Tom's mortal enemy in order to destroy the Espheni power plant. When Lexi returns, the mission to destroy the Espheni power core turns complicated on part 1 of the season finale of Falling Skies. 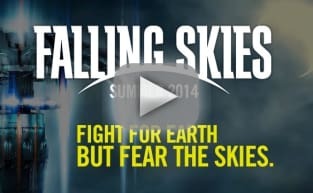 Tom learns to pilot an airship as part of a perilous mission to destroy the Espheni power core on Falling Skies. Tom and his team track the Volm in the hopes of fixing the crippled ship on Falling Skies. Maggie ends up fighting for her life and the 2nd Mass must pick up the pieces after an alien attack on Falling Skies. Tom and the 2nd Mass must work with the Volm to avoid and invasion while Lexi becomes more powerful on Falling Skies. Tom reunites with the 2nd Mass and his family but when someone falls ill, the celebration is short lived on Falling Skies. Tom comes across two strangers who take him on a violent odyssey on Falling Skies. Tensions rise between humans and the Volm when the 2nd Mass finds refuge in a Volm hideout on Falling Skies. The 2nd Mass comes up with a complex strategy to escape the Espheni Ghetto and Anne has a flashback about her time in the Espheni Tower on Falling Skies. Anne searches for her daughter while Tom must make an impossible decision concerning the Espheni plan on Falling Skies. Falling Skies is back for a brand new crazy season with this eye-opening premiere. Would you please stop talking like a damn fortune cookie? Permalink: Would you please stop talking like a damn fortune cookie?